Lincoln, Rhode Island- CES MMA rings in the New Year from it’s home at Twin River Casino, Saturday January 19th with a special matinee first bell at 2 pm Eastern time. With a New Year comes some very big changes for the Northeast’s elite combat sports promotion. A fresh off the presses deal with the UFC’s live streaming platform; UFC Fight Pass was struck earlier this month; ending a six year television partnership with AXS tv and AXS tv Fights. With more than 450,000 subscribers worldwide and an attachment to the UFC, the stakes at CES MMA just hit a whole new level! CES brass has a resolution; to kickoff their relationship with UFC Fight Pass in style, rolling out a stacked card highlighted by two World Title fights, as well as some UFC veterans making their long awaited returns to the CES MMA cage. In the Main Event CES Lightweight Champion Nate “The Snake” Andrews (14-1) looks to add to an impressive eight fight win streak (all finishes) when he puts his Lightweight Title on the line against BJJ Brown Belt and former Bellator/ LFA Lightweight Bryce Logan (9-3) in a fight that many believe will have UFC roster implications, regardless of the outcome. Newly crowned CES Bantamweight Champion and former Division 1 Wrestler (Appalachian State);Tony Gravely (16-5) defends his title for the first time in the Co-Main Event against CES fan favorite and rising star Kris Moutinho (7-2), a calculated striker who gets his first crack at the CES Crown. Eight fight CES veteran Eric Spicely (8-0 in CES, 10-4 Overall) as well a three fight CES veteran Tateki Matsuda (3-0 in CES, 13-9 Overall) will make their highly anticipated returns from stints with the UFC. The grappling and submission specialist Spicely hopes to break a three fight losing streak when he welcomes Kansas City striker Leo Pla (12-7) to the CES cage for the first time. Born in Tokyo, Japan, Matsuda found his home with Sityodtong, Boston and is a pioneer of the Flyweight division here in New England, he too will be looking to nix a multi-fight losing skid as he returns to CES to test Flyweight top-prospect Josh Ricci (4-1) who will look to bounce back of the first loss of his professional career against the veteran Matsuda. CES 54 will also roll out two of the promotions biggest new signings; Light-Heavyweight William “Nightmare” Knight (3-0) takes on CES veteran 205’er Kevin “The North Woods Nightmare” Haley (6-3) and Super Prospect Kylie O’Hearn (1-0) makes her highly anticipated CES debut against Reality Fighting Women’s Bantamweight Champion; Jessy Miele (6-3). Setting the stage for the six fight UFC Fight Pass Main Card will be an exciting four fight undercard that kicks off with a Catchweight bout featuring undefeated Philadelphia, PA product; Eugene “The Suitcase Kid” Aubrey (2-0) who looks to stay perfect against New England journeyman; Gil Pinheiro (0-2). Another top undefeated prospect; Brandon “The Kid” Marotte (4-0) will look to kick off 2019 much the same way he did in 2018, a year which saw Marotte go 4-0 and ascend the ranks of New England’s pro Featherweights. Marotte continues his climb against New England newcomer, Virginia's Chris “The Rocket” Rollins (5-8-1). Todd "The Matrix" Monroe (3-3) makes his first appearance for CES MMA and will be welcomed by Massachusetts’ submission specialist David Baxter (4-2), who has faced some tough competition since debuting with the CES promotion back in 2015. Finally, newly crowned New England Fights professional Cruiserweight Champion Yorgan deCastro (3-0) returns to the CES cage, where he is 2-0 in his career, as he welcomes Dallas, Texas’ Knockout artist Carlton “C-MAYJA” Little (7-6) to the CES cage for the first time. CES MMA’s Michael Parente, as well as Massachusetts native and former UFC fighter Tom “Filthy” Lawlor will play host as UFC Fight Pass presents for the first time; CES MMA 54! Tickets are available and can be purchased by visiting CESMMA.com or by visiting the box office at Twin River Casino Events Center. Last fight: First round Knockout (Punch) of Jake Kozorosky at Art of War Cage Fighting 9. Breakdown: With just two fights since turning pro in 2015 including a current layoff of nearly 15 months, Connecticut’s Pinheiro will be looking to resurrect his career that has seen him go 0-2 with tough losses coming to very talented fighters who would go on to fight for Bellator MMA (Lachinov, de Jesus). Enter Eugene Aubrey, Aubrey has cruised to a 2-0 start as a professional, needing under three minutes in the cage to dispatch his first two opponents, both by knockout. Aubrey packs some serious power in this hands and hopes to used that power early and become the next career launched at Pinheiro’s expense. Click below for our detailed breakdown of the remaining 9 fights on the CES 54 fight card! Last fight: First round TKO (Ground and Pound) of Joey Sanchez at Combat Zone 68. Last fight: First round knockout of Justin Dalton at Elite Warrior Challenge 19. Breakdown: After two knockouts to kickstart his career in the CES cage, upstart Featherweight; Brendon Marotte turned to Combat Zone MMA, in his home state of New Hampshire, where he has since reeled off yet another two dominating knockouts. Marotte is quickly garnering top prospect praise in the New England region as he looks for his fifth professional knockout against zero defeats. Marotte meets by far his most seasoned opponent to date at CES 54, when he bears greeting to Virginian; Chris Rollins. Rollins fourteen fight pro career has seen more downs than ups, however Rollins possesses some very real knockout power in his hands, enough so that he cannot be counted out in any fight. With that said this fight has all the makings to be a fight of the night candidate, especially if Rollins can keep this fight on the feet and slug it out with “The Kid”; Marotte. Last fight: Third round Submission loss (Armbar) to Cody Durden at 864 Fighting Championship. Last fight: First round Submission loss (Rear Naked Choke) to Kody Nordby at CES 42. Breakdown: North Carolina’s Todd Monroe is coming off back to back losses for the first time in his career, both to top Bantamweight prospect Cody Durden in the 864 Fighting Championship. In November Monroe stepped in on just two days notice to save the fight with Durden, both men battled back and forth for the better part of three full rounds before Monroe fell victim to an armbar with just four seconds left in the fight. Monroe will be making his second straight short notice appearance when he makes his CES debut against submission specialist David Baxter. With three of his four professional victories coming by submission, Baxter will surely be looking to exploit any holes in Monroe’s submission game. This fight will hinge heavily on both men’s ability to execute their game plans, on the feet Monroe looks to be the more talented striker, but if the fight makes it to the ground Baxter has the ability to display a bevy of submission techniques from nearly every grounded position that can end a fight in the blink of an eye. Last fight: First round Knockout (Punch) of Ras Hylton at NEF 36. Captured NEF Professional Cruiserweight Title. Last fight: First round Knockout of Josh Mellen at AMMO Fight League 5. Breakdown: After an Amateur career that saw Fall River’s Yorgan de Castro tested by some of the best Light-Heavy and Heavyweight fighters in the entire region, de Castro continues to show that a challenging Amateur campaign can often lead to resounding success as a pro. De Castro continues to show each time out that he is an evolving fighter that learns from each of this encounters in the cage. Yorgan has began his pro career with three straight knockouts but as the knockouts continue to pile up, the task continues to become tougher and Yorgan continues to rise to the occasion. Yorgan knocked out favorite; Ras Hylton, in November to become the first NEF Cruiserweight Champion and will once again square off with a dangerous striker, in heavy handed Dallas Texas native; Carlton Little. Little scratched the surface of the New England ranks last time out when he knocked out Josh Mellen in the first round at AMMO 5 and showed the region what his heavy hands are capable of, although de Castro poses a much more difficult task as Little’s second test here in New England. Last fight: Second round Submission (Guillotine) to Pat Walsh at CES 41. Last fight: First round Knockout of Walter Howard at Premier FC 27. Breakdown: The UFC Fight Pass portion of CES 54 kicks off with quite possibly the two most physically gifted fighters on on the CES roster lock horns, as top ten New England Light-Heavyweights Kevin Haley and William Knight take center stage. At first glance both of these men appear to be built like real life action figures and both men possess the strength that goes along with their stout builds. Haley, the taller and leaner of the two fighters, is a grappler who has tested his talents against some of the best Light-Heavy and Heavyweights New England has to offer. A grizzled veteran of the New England fight game Haley has become known for putting heavy pressure on his opponents, grinding his way to 6 professional wins in his 6 years on the professional circuit. Haley has played spoiler before in the CES cage, submitting super prospect Mike Rodriguez in the first round at CES 39 in 2016, Haley will have another dangerous prospect standing across the cage from his this time as he throws down with William Knight. Knight will give up five inches in height to Haley, but what Knight lacks in height he can make up for in power and quickness. Knight has the explosiveness to close the distance that he gives to Haley as Knight’s Muay Thai skills are decisively quick and calculated. Knight also has natural power and strength that should help him hang with Haley in grappling exchanges, this is a tall task for the up and coming Knight but a win here could vault Knight into New England title contention. Last fight: First round Submission (Rear Naked Choke) of Trisha Cicero at Cage Titans 40. Last fight: Second round Submission (Rear Naked Choke) of Calie Cutler at Reality Fighting. Breakdown: Since bursting on to the local scene in 2016 the name Kylie O’Hearn has been striking fear into the hearts of her opponents and any women in New England's Bantam and Featherweight divisions. Kylie’s only career loss came by split-decision at the hands of current Invicta FC Flyweight Kerri Kenneson, since the narrow loss to Kenneson, Kylie has began another winning streak including making good on her professional debut, with a first round submission victory over Trisha Cicero at Cage Titans 40 in August. O’Hearn’s physical gifts and unrivaled all around combat sports ability, makes her a problem for women of all sizes and experience levels. 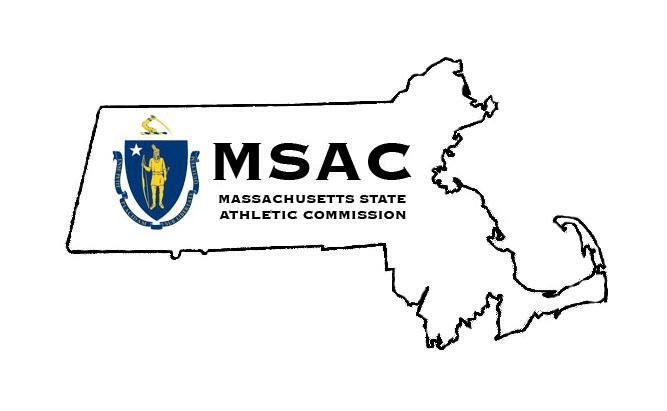 O’Hearn makes a big jump into the professional waters as she squares off with Reality Fighting Women’s Bantamweight Champion and New England veteran; Jessy Miele. Miele has been a student of the sport of MMA for over a decade and although she has been sidelined from competition for two years, that does not mean she has gone stagnant. Miele put in some of the toughest preparation of her career over the last two years in efforts to crack the cast of “The Ultimate Fighter” where she ended up falling just short. The Brazilian Jiu Jitsu Brown Belt Miele will need every bit of that experience and fight I.Q. if she hopes to put a stop to the Kylie O’Hearn hype train. Last fight: First round Knockout loss to Toru Ogawa at Pancrase 297. Last fight: Unanimous Decision loss to Johnny Lopez at CES 53. Breakdown: Tateki Matsuda’s march to the UFC began back in 2008 when Japan’s Matsuda stamped his professional passport with an opening minute Knockout of Wayne Clark at Reality Fighting. Matsuda capped that run in 2014 at CES 25; when a first round Submission of Robbie Leroux vaulted the Sityodtong product into the UFC. Tech would make his UFC debut just under a month later going the distance with undefeated Bantamweight Chris Beal, with Beal getting the nod on all three judges scorecards. Matsuda’s second showing in the UFC was equally as narrow, as he found himself on the wrong end of a split-decision to Joby Sanchez bringing his UFC record to 0-2 and subsequently leading to his dismissal from the organization. The Japanese striker returned to his homeland of Japan for three fights for the internationally recognized promotion; Pancrase and now after suffering two straight losses, Matsuda returns to New England where he cut his teeth as a fighter some ten years ago. Matsuda will share the cage with well rounded, top Flyweight prospect Josh Ricci. Ricci had faced little resistance in his professional career coming into his last fight against New England Flyweight pioneer Johnny Lopez; getting off to a 4-0 start as a pro. Lopez, however, exploited some defects in Ricci’s grappling game, handing Ricci the first loss of his pro career by Unanimous Decision. Ricci will be looking to return to form against another Flyweight pioneer Matsuda, in a matchup where Ricci will need to re-establish his dominance in the grappling department and display his evolution following the fight with Lopez. The ceiling still seems to be unlimited for New York’s Ricci and a win here against a former UFC fighter will restore some of the shine to the resume of the fast rising Flyweight. Last fight: Second round TKO (Punches) loss to Darren Stewart at UFC Fight Night 130. Last fight: Second round Knockout of Joe Rodriguez at Steelfist Fight Night 60. Breakdown: Tristar Gym product and Rhode Island’s own Eric Spicely accumulated an impressive 8-0 record, all under the CES banner, before making his run at the UFC on Season 23 of the Ultimate Fighter. Although the New England native fell short of the finals on TUF, his performance during the season eventually earned him six fights aboard the UFC roster, including battles with Veterans Sam Alvey, Thiago Santos and Gerald Meerschaert on his way to a disappointing 2-4 record for the World’s premier promotion, resulting in his dismissal following his Knockout loss to Darren Stewart in May of last year. Spicely’s go for broke submission attitude got him into some serious trouble in the UFC’s Middleweight division, where his willingness to take shots in order to get the fight to the mat did not always prove conducive against the top level competition. However, once on the mat Spicely possesses All-World type submission attacks leading to 6 career wins by submission. It will likely be more of the same Saturday as Spicely returns to CES for the first time in three and a half years as he matches wits with Kansas City Boxer; Leo Pla. PLa piled up finishes early in his career jumping out to a 9-2 record before losing 5 of this last 8 fights in the last 8 calendar years, including an over three year layoff between 2013 and 2016. Pla recorded his first knockout finish since 2010 in his last showing, folding Joe Rodriguez with a punch in the second round of their meeting at SteelFist Fight Night 60. Pla will need all the power he can muster in his two fists if he hopes to catch the hometown Spicely, before he is forced to tap. Last fight: Unanimous Decision victory over James Quigg at CES 53. Last fight: Fifth round Knockout of Drako Rodriguez at KOTC: Territorial Conflict. Breakdown: Make no mistake about it, with dominant decision victories over D’mon Blackshear and James Quigg, Featherweight star in the making Kris Moutinho has done all he can to for the hand of the CES organization, finally notching himself his first career pro title shot. Following back to back losses to Brandon Seyler Sr. and David Garcia as well as some questions about strength of opponents, some were left to question the capabilities of Milford’s Moutinho. However, since the back to back losses, Kris has done nothing but swing momentum back in his favor. Add a dominant first round drubbing of Al Jones at CES 50, to the two decisive aforementioned victories over Blackshear and Quigg, the talented striker Moutinho finds himself poised to challenge for his first CES World Title. Former Appalachian State Wrestler Tony Gravely sealed Moutinho’s fate at CES 53, capturing the CES Bantamweight World Title when he dropped Kody Nordby on his head just thirty-six seconds into the first round of their battle for the then vacant Bantamweight strap. With the win over Nordby and the CES belt around his waist Gravely quickly became considered one of the top ranked unsigned talents in the Country, climbing his career record to an impressive 16-5. Once again the hometown favorite Moutinho will be taking a huge leap of faith as he steps up to the elite ranks and challenges Gravely for his newly found crown, as Gravely instantly becomes the most dangerous fighter Moutinho has had the opportunity to match wits with. Without a doubt this is one of the biggest “show me” fights I have seen throughout New England region in a long time, Moutinho has made no bones about his desire to fight for the title, after doing his job dispatching three consecutive opponents it’s now time to show the World that he belongs at the top of Bantamweight discussions nationwide. Last fight: Split decision loss to Demarques Jackson at Bellator 204. Last fight: First round Submission (Triangle Choke) of D’Juan Owens at CES 51. Breakdown: CES Lightweight Champion Nate “The Snake” Andrews is already the most decorated fighter to ever call the CES cage home and that alone says a ton about his status as a Martial Artist. At an almost unignorable 14-1 in his career with all 14 wins coming by finish, the general consensus predicts that Andrews is just one title defense away from signing with the UFC. Boasting an opponents combined record of 108-89, Andrews could still be looking for that signature win to add to his already amazing list of accomplishments and get the call New England MMA fans have all been waiting for, for almost three years. CES matchmaker Patrick Sullivan has called on former LFA/RFA and Bellator Lightweight veteran Bryce Logan to give Andrews that test. Logan, the native of Sioux Falls, South Dakota is a Brazilian Jiu Jitsu Brown belt with a background in wrestling, who currently trains with Bellator Light-Heavyweight Champion and fellow wrestler; Ryan Bader at Power MMA in Gilbert, Arizona. In interviews Logan has given credit where credit is due to his opponent; Andrews, but makes no mistake about his intentions to come into Nate’s backyard and leave with Andrews’ belt around his waist. The Champion Andrews has other plans; plans to keep his CES Lightweight belt at home in Providence, Rhode Island, extend his winning streak to eight straight fights, and use his 15th career finish to emphatically stamp his ticket to the UFC Lightweight roster. 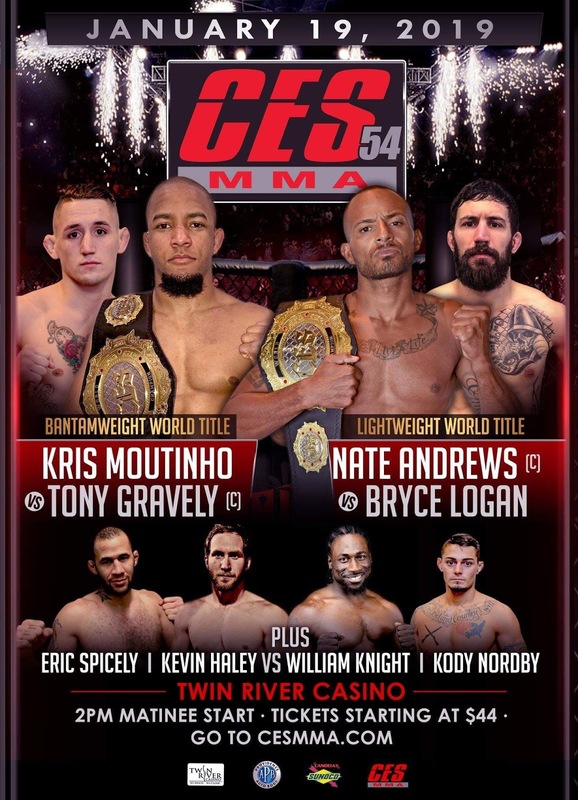 CES 54 promises to kick off 2019 with a bang, as these two talented Lightweights will headline CES MMA’s maiden voyage on it’s new platform; UFC Fight Pass, Saturday afternoon, live from Twin River Casino.